Teriyaki sauce ranges from thick to thin and salty to sweet depending on where you’re getting it from. This is my favourite teriyaki sauce recipe. Adjust the consistency and flavouring to your taste. Serve this with miso soup (recipe here) and Japanese restaurant style salad with miso dressing (recipe here). Photos above: Teriyaki sauce used as a marinade (left) and used as a sauce poured over cooked chicken (right). In a sauce pan over high heat, add rice wine and bring to a boil. Reduce the heat to medium and maintain a strong simmer until the alcohol burns off, about 6 to 8 minutes. Add soy sauce, rice vinegar, sesame oil, sugar, garlic, ginger, red pepper flakes, and a pinch of black pepper. Stir to combine and simmer for another 3 minutes. If you are using this sauce as a marinade: Allow the sauce to cool completely. Then marinate your meat for at least 1 hour. Strain the meat from the sauce and cook the meat. In a small, heavy bottomed sauce pot, bring the remaining marinade to a rolling boil for 30 seconds. Then stir in the cornstarch water. Reduce the heat and continue to simmer, stirring occasionally, until you achieve the desired consistency. Adjust the soy sauce, rice vinegar, and sugar to your taste. Toss with your cooked meat or pour over your dish. If you are simply making a sauce: Stir in the cornstarch water and simmer, stirring occasionally, until you achieve the desired consistency. Adjust the soy sauce, rice vinegar, and sugar to your taste. Pour over cooked meat, vegetables, and/or rice. 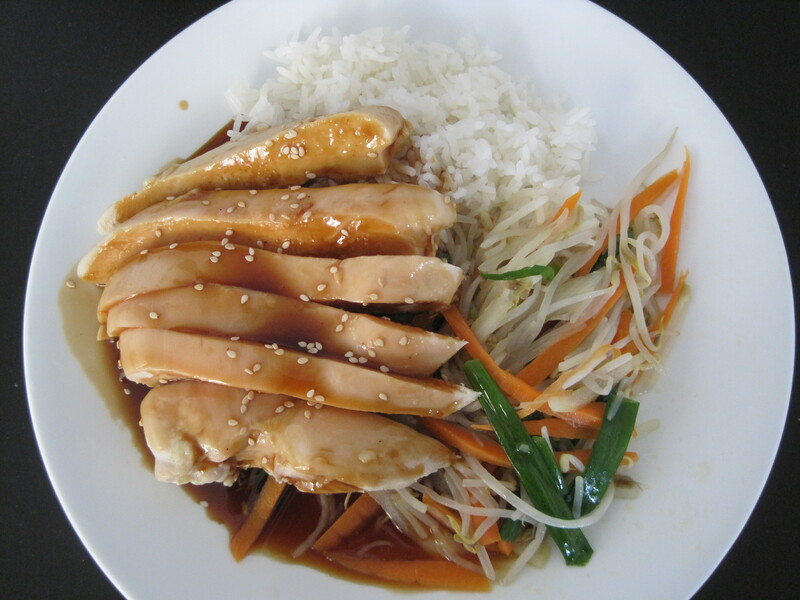 Marinate the chicken in the teriyaki sauce (recipe above) for at least 1 hour (up to over night in the refrigerator). Strain the chicken from the marinade and reserve the liquid. Cook the chicken by grilling, baking, or stir frying. In a small, heavy bottomed sauce pot, bring the remaining marinade to a rolling boil for 30 seconds. Then stir in the cornstarch water. Reduce the heat and continue to simmer, stirring occasionally, until you achieve the desired consistency. Adjust the soy sauce, rice vinegar, and sugar to your taste. Toss with your cooked meat or pour over your dish. Garnish with sesame seeds (optional). Serve with white rice and stir fried veggies. I like to use what the restaurants use – a stir fried bean sprout medley (recipe below). Note that you shouldn’t season the vegetables too heavily because the teriyaki sauce is already very flavourful. Heat a wok over high heat. When the wok is hot, add the oil and swirl the wok so that the bottom half of the wok is coated. Then add the onions and carrots and stir fry continuously until just softened. This will not take long so do not overcook them. The onions will have lost their bite and both the onions and carrots should be tender but still crisp. Then add the bean sprouts, green onions, sesame oil (if using), a pinch of salt and a dash of white pepper. Stir fry continuously until the bean sprouts just start to soften. Once again, do not overcook them. The bean sprouts should still be crisp and the green onions should be just wilted. Dish out and serve immediately. Great recipe. It looks amazing… Wish I had the patience to make it! Thank you so much for commenting! Have a great day! This looks so yummy. I think I might make it substituting honey for the sugar and Bragg’s Liquid Aminos for the soy sauce. I’ll bet honey would be delicious! Good idea! It would probably shorten the time you would need to boil the sauce for too. I’ve never heard of Bragg’s liquid aminos before. Thank you for introducing me to that! I just made this last night and it was delicious. We were having chicken teryaki. I had a bag of bean shoots that I’d forgotten to add to another recipe. I also used a 1/4 of green cabbage and didn’t have any green onions. I’ll definitely make this again, thanks. I been exploring for a little for any high quality articles or weblog posts on this sort of area . Exploring in Yahoo I at last stumbled upon this web site. Reading this info So i glad to convey that I’ve an incredibly excellent uncanny feeling I found out exactly what I needed. I such a lot no doubt will make certain to do not omit this site and provides it a look regularly.